An unexpected development in the case of murdered Saudi journalist Jamal Khashoggi comes after an Egyptian woman claimed to have married him at a secret wedding held in the US, a few months before his death at the Saudi Consulate in Istanbul, Russia Today quoted The Washington Post as saying on Sunday. Khashoggi’s family declined to comment to The Washington Post, as did Sheikh Anwar Hajjaj, a professor of Islamic studies at the American Open University in Virginia who was said to have finalized the couple’s marriage contract. Khashoggi’s Turkish fiancée, Hatice Cengiz, told The Washington Post in a telephone call that she did not know about Khashoggi’s secret marriage to the Egyptian women, questioning her motives. Cengiz accused the Egyptian wife of attempting to distort the Khashoggi’s reputation and image. The Washington Post reported that, if the marriage is confirmed, the Egyptian wife will have the right to receive part of the compensation provided to the journalist’s family by the Saudi government. The wife, referred to by The Washington Post as “H. Atr.” to protect her identity, confirmed that the wedding was held secretly without the knowledge of Cengiz and Khashoggi’s family. Atr justified her decision to disclose her marital relationship with the late Khashoggi by saying that she sought recognition and her right as a Muslim wife. The Washington Post added that the woman handed them text messages she had exchanged with Khashoggi and personal photographs showing them together, including several during the wedding held on the outskirts of Washington in June. The newspaper said some of those photos were reposted on Twitter accounts loyal to Saudi Crown Prince Mohammed bin Salman. An old friend of Khashoggi who claims he witnessed the marriage to Atr confirmed the woman’s allegations, also calling on the newspaper not to identify him for security reasons. 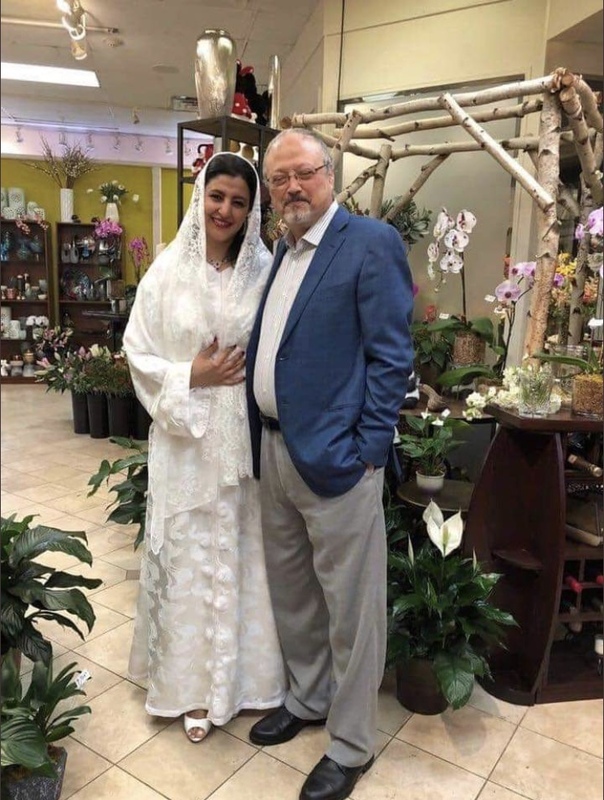 Atr stated that she had provided evidence of her marriage from Khashoggi to Saudi and Turkish consulates in a Middle Eastern country. Twitter accounts that published the marriage photos claimed that the wife’s first name is Hanan. The 50-year-old secret wife told The Washington Post that she lives in the Gulf region and spent time with Khashoggi when she arrived in the US for a work visit, adding that she met Khashoggi for the first time 10 years ago in a media forum in the Middle East, but their relationship only began in 2017. Atr said that she saw Khashoggi for the last time in September, stressing that he had expressed more than once his concern over the possibility of the Saudi authorities taking steps against him, but did not believe that there was a threat to his life.